As I relayed in my recent review of their The Unspoken Hymns release, Mournful Congregation have long been a favourite of mine. There’s something about the band’s thoughtful and emotive mixture of death and doom that has always hit just the right notes for me though I have to admit that, as good as 2009’s The June Frost was, it didn’t quite live up to the expectations I had built up as a result of their 2005 release, The Monad of Creation. The band changed up their sound ever so slightly and incorporated a number of shorter tracks on that release which were all good in their own right but there were too few of the long epics that featured so prominently on The Monad of Creation, which is what I adored most about it. 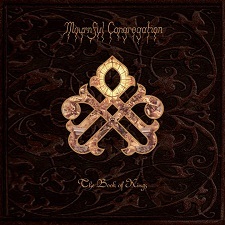 With their latest release, The Book of Kings, Mournful Congregation have returned to the sweeping epics that made The Monad of Creation such an excellent album and turned in something that surpasses the high watermark reached on that album. With four tracks and a running time of just shy of 80 minutes, The Book of Kings is a monster of an album in all senses of the word but never once does it give the impression of bloat or redundancy. This can largely be attributed to Mournful Congregation’s ability to craft what I would define as ‘wandering compositions’ which rarely, if ever, repeat themselves and choose instead to unfold more like a story before the listener. Traditional verse/chorus patterns are replaced with a seemingly endless stream of riffs and mini movements that unfurl at their own discretion over the span of each track, creating an ebb and flow dynamic to the compositions that are held together by an overarching directional arc of musical prose. While Mournful Congregation clearly and comfortably fit within the classification of doom (or even funeral doom at times) something that has always endeared me to them is that they are capable of elevating themselves above genre convention by allowing their compositions to organically and emotionally shift when a piece calls for it. I sometimes get the impression that bands of this ilk feel the need to go straight for the ‘sad’ button right from the start and do everything within their power to stay firmly rooted in the depths that they dwell, never once thinking about bringing perspective and context into the equation. What I mean, essentially, is that emotions do not exist in a vacuum and an album’s worth of crippling melancholy, while undoubtedly effective on one hand, offers only a partial glimpse at the entire picture and without context it can often be little more than a blunt instrument rather than an effectively evocative and moving experience. What is apparent even within the first few minutes of The Book of Kings is that, stylistically, the music is very much a product of Mournful Congregation with the use of diverging guitar melodies, tasteful solos, harmonised passages and even the odd pitch bend here and there but it is also a much more mature presentation of their style as well. I’ve never had an issue with the way the band builds their tracks but the flow and structure on this album is damn near flawless this time around. Even on a track like the titular closing number, which clocks in at 33 minutes and features a number of differing sections and movements, the whole thing just fits together so smoothly and so convincingly that, by the time it’s run its course, you won’t have even realised that 30 minutes has passed. This is no small feat I would surmise. With The Book of Kings, Mournful Congregation have once again reaffirmed their place within the upper tier of the doom genre with what is easily their best and most mature work to date.